Nagaland Governor P B Acharya was of the view that the entire north-eastern region has its unique distinctive character for its culture and traditional lifestyle. 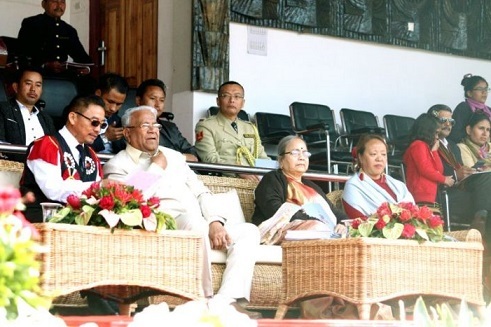 While saying this at the second day of the on-going Hornbill Festival on Sunday, the Governor called upon the artists, craftsmen, weavers and the likes to continue their efforts in keeping the tradition and culture of the Northeast alive. He said the people were talented in arts and skilled in handicrafts and handlooms, and their handicrafts and handlooms were acclaimed worldwide. Acharya was of the view that the handicraft and handloom items of the north-eastern states were in high demand all over the country and abroad. He also said that the culture and tradition of the Northeast offers a colourful mosaic, adding that every tribe from each of the north-eastern states has its own unique culture, food and crafts. While addressing the National Dance and Music Day as part of North East Day in the Hornbill Festival, organized by North East Zone Cultural Centre (NEZCC) at Kisama, the State Governor said that though each tribe has its own identity, culture, tradition, people live in harmony and peacefully. Acharya exuded confidence that guests from within and outside the State and from abroad who have come for the Hornbill Festival would further facilitate in popularizing the culture and tradition of the north-eastern states, especially Nagaland. While maintaining that festivals are the integral part of tribes along with traditional dance and folk music, the Governor stated that the festival season is the best time to know the culture and traditional costumes of the Northeast.